Wendy's paintings can be seen reproduced as prints and cards as well as in various publications including ‘Wicca and Witchcraft’ magazine, ‘The Pagan Wheel’, ‘Spirit and Destiny’, ‘The Bardic handbook’ by Kevan Manwaring published by Gothic Image, ‘The Personality Profiler’ by Claire Gordon published by Carroll & Brown Ltd, ‘Fairies 101’ by Doreen Virtue published by Hay House, and ‘Pentacle’ magazine Summer 2007. Also in Doreen Virtue's Goddess oracle cards and Unicorn oracle cards. 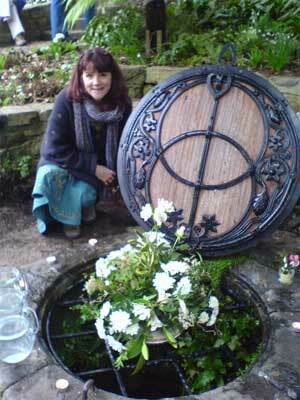 The original of Wendy's Goddess wheel of the Year can be seen in the Goddess Temple in Glastonbury. 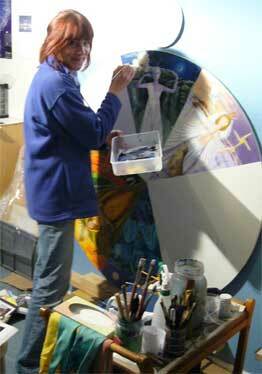 (www.goddesstemple.co.uk) Here is a photo of the painting in creation! Wendy works mainly in watercolour, but she also uses oil, acrylic and pastel. 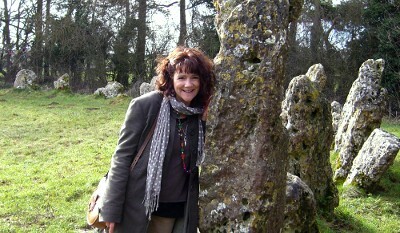 Wendy says “The shimmering beauty of the natural world inspires me and the dream-like realms of myth are my passion. Once upon a timeless time we enter the misty realms of long ago and forever. Here the ancient stories are told that teach us of the cyclic nature of life... of the beneficence of Mother Earth, Her strength and Her fragility of the battles and harmonies between male and female... and on and on... This is the timeless time of our inner knowing and here life truths are known.